First of all, why is insurance important? While you never plan to get sick or hurt, most people need medical care at some point. 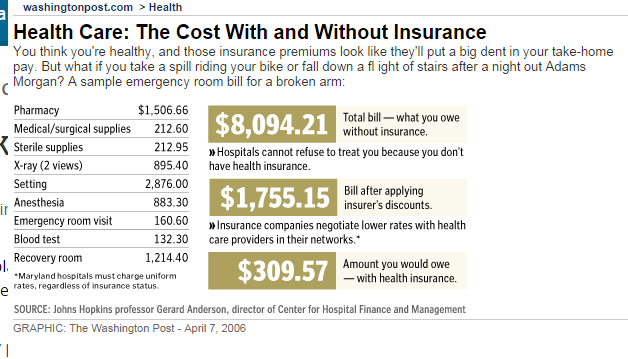 Health insurance covers these costs and protects your from very high expenses. For example, did you know that fixing a broken arm can cost up to $8,000? Or that the average cost of a 3-day hospital stay is $30,000? Having health insurance coverage can protect you and your family from high, unexpected medical costs. But I have HealthCare Access, why do I need insurance? Well, mostly because we aren't insurance. If we've taken care of you so well you have forgotten we're charity care, we're thrilled, but at the end of the day nothing can compare to health insurance. We want what is best for your health and that means becoming insured when you can. That's why we require our patients to register for the Affordable Care Act and to demonstrate to us that insurance is either not available or not affordable through their employer – insurance is far and away the best option for you. We will always be here for you if you can't purchase insurance, but if you can, then you will need to enroll in coverage. If my children have Medicaid or NC Health Choice, do I have to purchase insurance for them? No. If your children have either of these forms of coverage, they meet the Minimum Value Standard for coverage and do not need insurance. I have Family Planning Medicaid. Is this enough coverage to avoid the penalty for not having insurance? No. Family Planning Medicaid only relates to family planning and pregnancy. This coverage DOES NOT meet the Minimum Value Standard. You may have to purchase insurance, unless your income is too low and you may be exempt from the penalty. Can I rely on my health insurance if I travel? Possibly. Your insurance coverage depends on the policy you choose. Typically, insurers offer plans with national networks that would allow you to see many doctors, even in other states. However, the smaller the network on your plan, the more likely you will have to pay out-of-network costs to cover any medical needs outside of your usual network. What is a Granfathered insurance policy? If you are covered by a plan that existed March 23, 2010, your plan may be “grandfathered.” You may not get some rights and protections that other plans offer. There are 2 types of grandfathered plans: job-based plans and individual plans (the kind you buy yourself, not through an employer). Job-based grandfathered plans can enroll people after March 23, 2010 and still maintain their grandfathered status. They can do this as long as the plans haven’t been changed in ways that substantially cut benefits or increase costs for consumers, notify consumers with these policies that they have a grandfathered plan, and have continuously covered at least one person since March 23, 2010. Individual grandfathered plans can’t newly enroll people after March 23, 2010 and have that new enrollment be considered a grandfathered policy. But insurance companies can continue to offer the grandfathered plans to people who were enrolled before that date. An insurance company can also decide to stop offering a grandfathered plan. If it does, it must provide notice 90 days before the plan ends and offer enrollees other available coverage options.